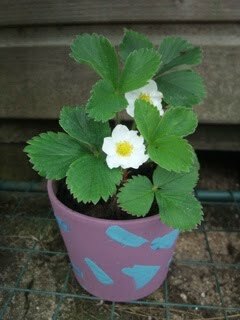 I have been talking for a while about doing something better with the strawberries this year. 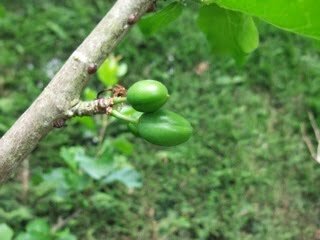 Last year I didn't get a single taste as the Bean was out every day eating them the moment they were vaguely red so this year I am keeping a beady eye on them. We had a load of plain pots from a previous project so we painted them up using our stock of tester pots I use for all the wall paintings and I think they look pretty good. 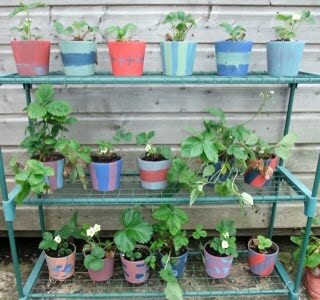 I stuck one of the seedling shelf units from the greenhouse by our shed and they now look quite happy. It's pretty shaded which is good because they don't need as much water but I'm not sure how they will perform so they may be moved later. 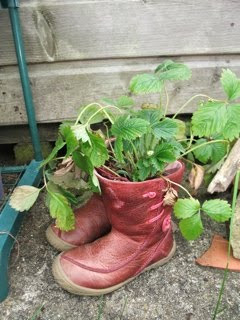 These are a couple of the Beans old boots put to good use. I love it when things blossom because you know good things are on the way! 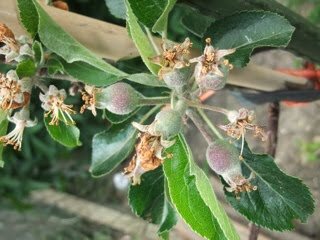 These are not just apples, people, but DISCOVERY APPLES...the greatest variety every and I can't wait to see if they make it through the June drop. And these are some of our plums that survived the frost.